Being Taken for Granted in a Relationship? What Should I Do? Being taken for granted in a relationship happens when we feel unimportant, cast aside, or like our needs and concerns are a low priority to our partner. All we really want from the one we love is to know that we matter, and we are special to our partner. It is a very specific feeling that we must receive from the person we love. Because we love them so much, we must feel they love us just as much. And we feel it so fiercely when we don’t get it. And when that happens we end up feeling as if our mates just don’t care enough. I saw this recently in a client. She was hoping to see her beloved for a special day but the partner had other things to do. On any other day, this might have been OK, but not on this day. The woman felt horrible. How could her beloved not make her a priority she expressed? How could he not know that the event was important to her? How could he not even understand the gravity of his actions of not being available? So much was said in the inability of the partner to attend to his mate. So much unspoken disappointment that lots of things were decided as a result. He doesn’t care enough she thought. I am not a priority to him she added. How many of us have felt this at some time in our relationship? It is very common for people to wonder if their partner loves them enough. It’s also very common for people to not really trust that they do. So, how do we build something that is reliable and stable between two people? We start by understanding each other’s needs. We tell our partner what we need from them, if they don’t know. These are just good relationship skills where we let our mate know what is important to us so they don’t miss us. But not everyone comes into a relationship knowing how to do this. Especially when we love our person so much. When we feel so loved by our mate we imagine that since they love us and we love them they must know everything about us and will always know how to make us happy. This is a fantasy that many couples fall into. And you can see why. We are taught in our society that all we need is love. If we fall in love with the right person we will be happy. All our fairy-tales end when the couple falls in love, right? So where do we learn what to do after that part, which we know realistically is just the beginning? We learn how to grow with our person while we are in relationship with them. This means that when we get our feelings hurt, which we will because we are really two separate people with different brains and ideas, we must learn how to communicate what our feelings are to the person we love without blaming them. This is a skill and it’s not something a lot of us have when we begin relationships. We just tell our mate what we don’t like. Now reverse this and apply the disappointment or dislike on yourself. Would that feel good for you to hear? Probably not. To have a successful relationship we have to learn how to say things to our mate in ways that they understand us and want to change because they love us and want us to be happy. It’s possible that they disappoint us because they don’t really know what we want. If we can master this skill we will be happy and we will feel what is most important to all of us, that we matter. Feel Important, Instead of Taken for Granted! 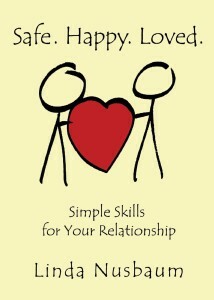 Learn how to feel important and cherished in your relationship, by reading Linda’s book, Safe. Happy. Loved. Simple Skills for Your Relationship. It can help you learn to communicate your needs in a way your partner will understand, so you feel like a priority, not an afterthought. Give it a read. This entry was posted in Communication, Couples/Relationships, Uncategorized and tagged arguments, communication, couples counseling, frustration, unhappiness. Bookmark the permalink. →Why Doesn’t My Partner Help Me?